This Companion to Protestantism brings together new contributions from internationally renowned scholars in order to examine the past, present and future of Protestantism. Co-edited by leading Protestant theologians Alister E. McGrath and Darren C. Marks, with contributions from internationally renowned scholars. Opens with an investigation into the formation of Protestant identity across Europe, North America, Asia, Australasia and Africa. Includes coverage of leading Protestant thinkers, such as Luther, Calvin, Schleiermacher and Barth. Considers the interaction of Protestantism with different areas of modern life, including the arts, politics, the law and science. Debates the future of Protestantism in both Western and non-Western settings. 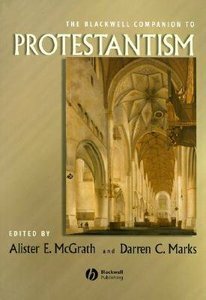 .^Introduction: Protestantism - the Problem of Identity: Alister E. McGrath (Oxford) and Darren C.Marks (University of Western Ontario). 1. Protestantism in German-speaking Lands to the Present Day: Randall C. Zachman (University of Notre Dame). 2. Shapers of Protestantism: Martin Luther: Graham Tomlin (St Paul’s Theological Centre, London). 3. Shapers of Protestantism: John Calvin: Alister E. McGrath (Oxford). 4. Shapers of Protestantism: F.D.E.Schleiermacher: Nicholas Adams (University of Edinburgh). 5. Shapers of Protestantism: Karl Barth: John Webster (University of Aberdeen). 6. English Protestantism to the Present Day:Gerald Bray (Samford University). 7. Scottish Protestantism to the Present Day: Kenneth B.E. Roxburgh (Scottish Baptist College). 8. Welsh Protestantism to the Present Day: D. Densil Morgan (University of Wales). 9. Irish Protestantism to the Present Day: Alan Ford (University of Nottingham). 10. Nordic Protestantism to the Present Day: Aasulve Lande (Lunde University). 11. Protestantism in the Netherlands to the Present Day: Peter van Rooden (University of Amsterdam). 12. Protestantism in Eastern Europe to the Present Day: Parush Parushev and Toivi Pilli (International Baptist Theological Seminary, Prague). 13. French Protestantism to the Present Day: Alister E. McGrath (Oxford). 14. Italian Protestantism to the Present Day: Alister E. McGrath (Oxford). 15. Protestantism in the United States of America to the Present Day: John Corrigan (Arizona State University). 16. Shapers of Protestantism: Jonathan Edwards: Steven R. Holmes (St Andrew’s). 17. Canadian Protestantism to the Present Day: Darren C. Marks (University of Western Ontario). 18. Indian Protestantism to the Present Day: Ivan Morris Satyavrata (Southern Asia Bible College). 19. South-East Asian Protestantism to the Present Day: Hwa Yung (Trinity Theological, Singapore). 20. Japanese Protestantism to the Present Day: Nozomu Miyahira (Seinan Gakuin University, Japan). 21. Korean Protestantism to the Present Day: Yong-Gi Hong (Hansei University). 22. Chinese Protestantism to the Present Day: Carver T. Yu (Hong Kong). 23. Protestantism in Australia, New Zealand and Oceania to the Present Day:Ian Breward (University of Melbourne). 24. African Protestantism to the Present Day: John S. Pobee (Ghana). ^25. Protestantism and the Bible: R. Kendall Soulen (Wesley Theological Seminary). 26. Protestantism and the Arts: Trevor Hart (University of St. Andrew's). 27. Protestantism and Politics, Economics, and Sociology: J. Philip Wogaman (Wesley Theological Seminary). 28. Protestantism, Law and Legal Thought: John Witte Jr. (Emory Law School). 29. Protestantism and the Sciences: Ted Peters (Pacific Lutheran Theological Seminary). 30. Protestantism and Liberalism: Mark D. Chapman (Ripon College, Oxford). 31. Protestantism and Feminism:Cynthia L. Rigby (Austin Presbyterian Theological Seminary). 32. Protestantism and Fundamentalism: William V. Trollinger Jr. (University of Dayton, Ohio). 33. Protestantism and Racism: Paul R. Griffin (Wright State University, Dayton, Ohio). 34. Protestantism and Judaism: Clark M. Williamson (Christian Theological Seminary, Indianapolis). 35. Protestantism and Spirituality: Bradley P. Holt (Augsburg College). 36. Protestantism and Missions: Werner Ustorf (University of Birmingham). 37. The Future of Protestantism: Ecumenism and the Main-Line Denominations: Alan D. Falconer (World Council of Churches). 38. The Future of Protestantism: Evangelicalism: Mark A. Noll (Wheaton College, Illinois). 39. The Future of Protestantism: The Rise of Pentecostalism: Allan Anderson (University of Birmingham). 40. The Future of Protestantism: Postmodernity: Graham Ward (University of Manchester). 41. The Future of Protestantism: The Non-Western Protestant World: Allan Anderson (University of Birmingham). About "Blackwell Companion to Protestantism"
Darren C. Marks (D. Phil., University of Oxford) is assistant professor of Theology and Jewish Studies at Huron University College at the University of Western Ontario. He is the author of over a dozen articles in systematic theology and the author/editor of several texts in theology including Blackwell Companion to Protestantism; Shaping a Theological Mind; Shaping a Global Theological Mind; Bringing Theology to Life: Key Doctrines for Christian Faith and Mission and Justifying God: A Theology of Sin.